Images courtesy of the artists. Photo of Katherine Bingley’s Eclectic Roots installation. As Long Beach’s highly anticipated Music Tastes Good (MTG) festival draws closer, more developments in the art installation department have been made. The five installations selected after the second and final phase of the application process have been announced and feature a wide array of creative ideas set to come to life during the music and food festival. 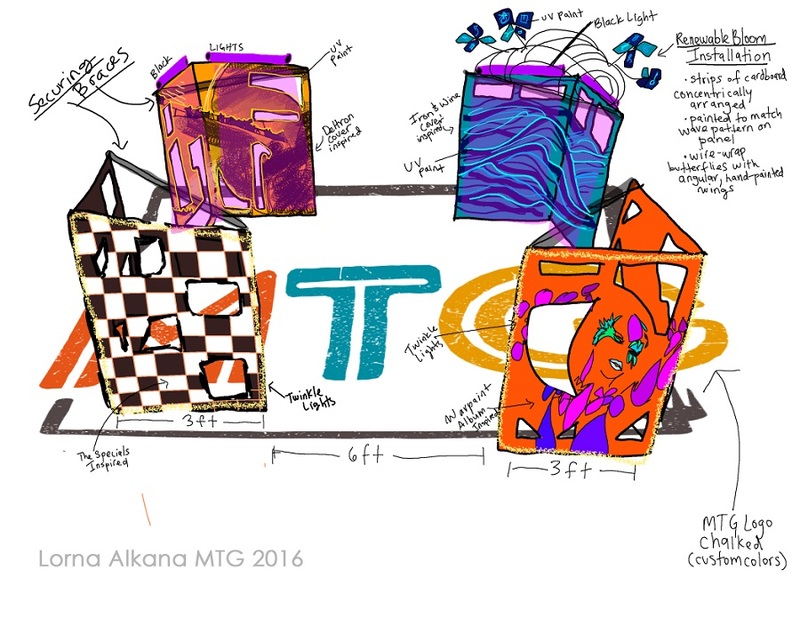 Orange County-based artist Dan Benedict was selected to bring his interactive kinetic installation Parasolvent to MTG, where viewers will be able to turn a crank to rotate a large wheel of opening and closing parasols. 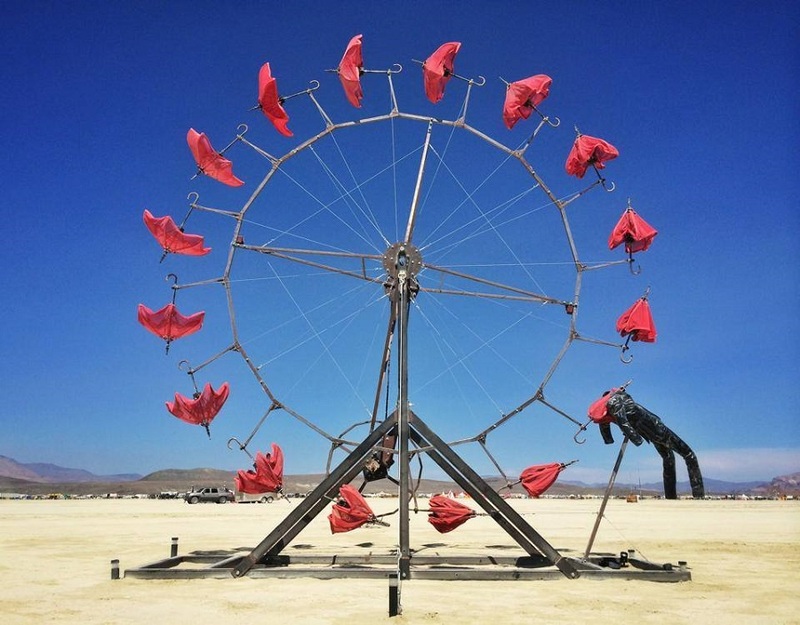 Parasolvent, just one of the artist’s “nerdcentric” endeavors, will be tested on burners at this year’s Burning Man before landing in Long Beach. The installation titled Band Boxes will be placed in the middle of an intersection and may provide shade and a meeting place for MTG attendees. 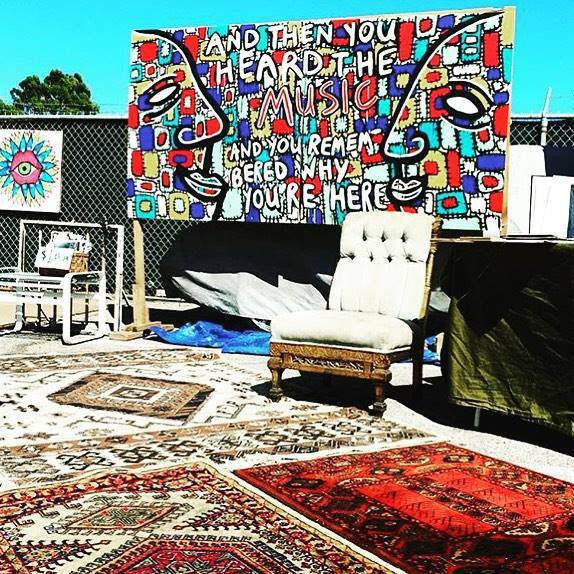 Los Angeles-based artist Katherine Bingley plans to transform the boxes with her colorful characters, featuring the lyrics from bands playing at the festival. 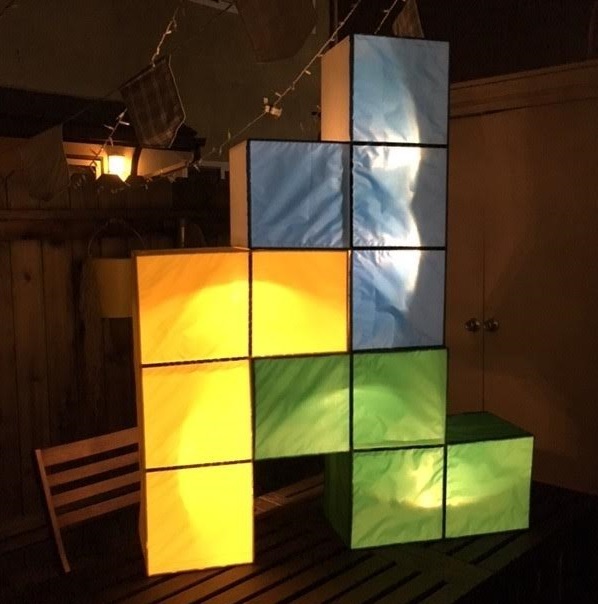 Long Beach artist and crafter extraordinaire Kelsey Cooper submitted Tetris Blocks, a giant installation where multiple people can stack the different colored blocks at the same time, emulating the 1980s video game. Set upon an astro turf area, the installations would stand out day or night, with lights placed inside each of the boxes to shine through and attract participants. Danielle Kaufman, an installation designer at The Industry and former actress at the Queen Mary’s famous Dark Harbor event knows more than a thing or two about what a good festival experience entails. 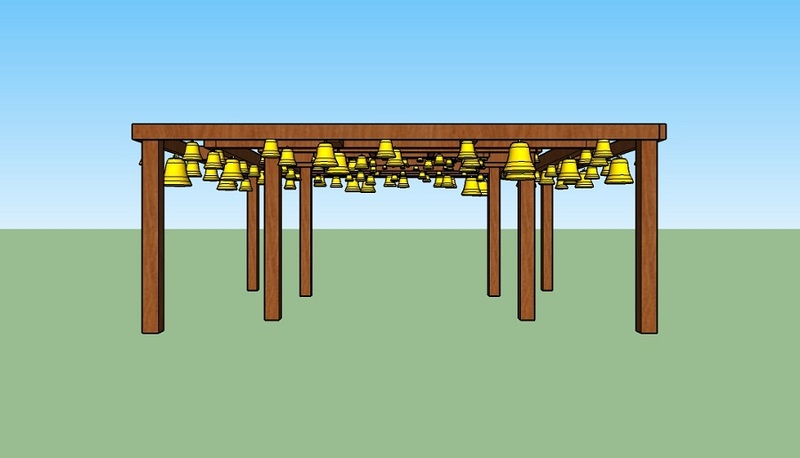 Her installation, Rumination Attuning, is a wooden temple space where ruminations, or written personal thoughts, are located above hanging bells of different pitches. Attendees can contribute their own ruminations or ring the bell that resonates with them the most. Local artist Lorna Alkana’s Found Windows will feature a panel covered with chalk paint that attendees can use to answer the question, “How does music taste good?” Moving wire and fiber sculptures, sound reactive projection art and illuminated painted windows inspired by album covers featuring MTG musicians will bring the four structures to life. For more information about Music Tastes Good, visit the website here. Please contact Nicolassa Galvez at [email protected] for more information about the art installations.